Vicente Salvador Gómez was born into a family of Valencian artists in 1637. Together with his brother Luciano he received his first lessons in art in the studio of his father, the painter Pedro Salvador. There he learned to grind and prepare the pigments and also assisted his father with various commissions. Between 1647 and 1649 he furthered his studies by moving to the studio of Jerónimo Jacinto Espinosa (1600-1667), the most important Valencian painter of the day. Salvador Gómez’s first documented works date from the late 1650s after he had set up as an independent artist. They include the series on the life of Saint Ignatius Loyola for the Jesuit house in Valencia and the painting of Saint Aloysius Gonzaga before the Virgin of Good Council (Valencia, Museo de Bellas Artes). The first major commission that he received dates from 1663, when he was asked to execute four large paintings on the life of Saint Vincent Ferrer for the monastery of Santo Domingo in Valencia, of which only two have survived to the present and are still in situ. 1 From that date onwards the artist’s fame increased, bringing more commissions, particularly after the death of his former master in 1667. Over the following years he thus worked for the principal religious Orders, including the Dominicans (1668) and the Jesuits (1670), and for private clients of the importance of the Duke and Duchess of Segorbe, for whom he painted two paintings in 1671 of Saint Pascual Bailón and Saint Vincent Ferrer (both lost). A year later Salvador Gómez was commissioned to decorate the Dominican convent of the Magdalena, of which only a few canvases have survived, in extremely poor condition. Notable among them is the one painted for the church’s choir, depicting Our Lady of the Rosary protecting the Dominican Order (Valencia, Museo de Bellas Artes), for which there is a splendid preparatory drawing in the Biblioteca Nacional in Madrid (DIB/16/41/1). In 1673 the artist acquired from the monastery of the Portacoeli all the books, drawings and prints left there by Alonso Cano. These would provide a source of inspiration for his works and for the preparation of his Cartilla y Fundamentales reglas de la Pintura [Instruction manual and basic rules of painting] (1674. Patrimonio Nacional, Real Biblioteca, inv. II/3727), intended for the instruction of pupils at the Academia de Santo Domingo in Valencia, of which Salvador Gómez was director from 1670. 2 In the last years of his life he continued to paint for the principal religious Orders and for private clients, producing some of his most important works, such as The Expulsion of the Money Traders from the Temple (Museo del Prado, P-2661). Salvador Gómez died aged forty-one on 7 April 1678. Apart from his paintings, a significant number of drawings by the artist have survived, allowing for a study of their technique. Most are executed with a fine pen, energetically applied to the paper with rapid, zig-zag movements. The pen is also used to create cross-hatching to suggest light and shadow, resulting in drawings that could almost be preparatory studies for prints. 3 All these characteristics are evident in the present sheet, depicting Christ appearing to Saint Vicent Ferrer. The technique is identical to that found in other sketches by the artist, such as Angels adoring the Name of Christ and the Immaculate Conception with God the Father (Museo del Prado, D-193) and Saint Francis of Assisi embracing the crucified Christ (British Museum, inv. no.1846,0509.185). 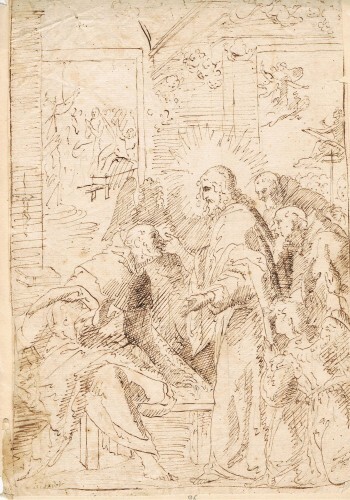 The drawing’s composition almost exactly repeats the painting of Christ appearing to Saint Vincent Ferrer painted in 1605 by Francisco Ribalta for the Seminary of the Corpus Christi in Valencia. The principal episode takes place in the centre of the composition and is depicted on a large scale. Next to it, in the upper area are two windows housing two secondary scenes on a smaller scale, namely the miracle of the saint on the left and Saint John’s vision on Patmos on the right. Interestingly, a comparison between this sketch and Ribalta’s preparatory drawing (Barcelona, MNAC, inv. no. 6611-D) reveals far less differences between the two works. Neither Ribalta’s sketch, for example, nor the present one include the angels that appear in the painting behind the saint. In addition, the scene of the miracle of Saint Vincent is identical in both drawings but not in the painting. The only differences are in the scene of Saint John’s vision on Patmos, which Salvador Gómez inverted in relation to the original. All this suggests that he was in direct possession of Ribalta’s drawing when he produced his sketch. More complex is the issue of the circumstances of the production of the final painting, if indeed there was one, as the present drawing could be a study exercise by the artist. Among the numerous lost paintings on Saint Vincent Ferrer by Salvador Gómez are two of the canvases painted for the monastery of Santo Domingo in Valencia between 1663 and 1665; the principal painting for the saint’s chapel in the monastery of Santo Domingo; 4 and the one executed in 1671 for the Duke of Segorbe, for which the present drawing could be a preparatory study. 5 For all the above reasons this drawing should be placed within those dates. Both paintings, The Restitution of the Crown to King Ferdinand and The Prophesy of Saint Vincent Ferrer in the Plaza del Born in Barcelona, are signed and dated 1665. On the artist, see the studies by Orellana (1930/1995); Pérez Sánchez (1980), pp. 69-78; Navarrete Prieto (1995), pp.135-140; and specifically, the monograph by Marco García (2006), in particular pages 31-48 with his biography. On the instruction manual, see Angulo and Pérez Sánchez (1988), pp. 78-79, cat. nos. 402-407 and Marco García (2006), pp. 80-85. On the artist’s drawings, see Pérez Sánchez (1986), pp. 316-317; Angulo and Pérez Sánchez (1988), pp.75-79, cat. nos. 381-408; and Renaissance to Goya (2012), pp. 171-175. Orellana (1930/1995), p. 264 and Marco García (2006), p. 226. Marco García (2006), p. 227.